The Singleframe® grille reflects the grand artistry that went into the development of the model. The grille complements the overall design nicely without detracting from it. The grille is almost evocative of a racecar, and this look adds to the uniqueness of the sedan's appeal. As with any grand work of automotive art, the "little things" on the Audi S4 contribute to its brilliant style.The folding side mirrors, for example, aren't just functional. They add to looks. Owning the coolest-looking car likely appeals to you. 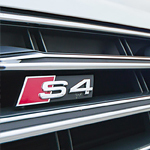 Come down to Audi Salt Lake City and check out the S4 or take one out on a test drive.